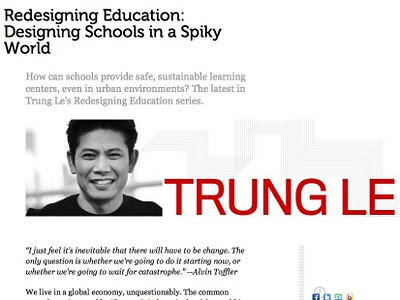 I read a really interesting and challenging article recently from my friend Trung Le discussing that, considering so many of the worlds population live in urban areas, (and the percentage is rising), we still do not have learning environments for the Third Millenium right yet - especially in the K-12 sector. If the population is centred round cities, and not spread evenly, then it is not a flat world but a 'spiky' one. It's a powerful article and one that is hard to disagree with. Le suggests a range of interesting solutions for redesigning education within an 'urban fabric' to create more intelligent city centres and a more sustainable planet. To read the article in full click here. Le is an architect, principal education designer of Cannon Design based in Chicago -- he is also a very smart guy! I have worked with him in the States and the Cayman Islands, where he was the lead architect for the fab radical new learning campuses currently being built. However, he is much more than that - he is also becoming a major education thinker and one of the brains behind the outstanding book: The Third Teacher' - mentioned several times in this blog already, including the American Launch, the UK launch and the Third Teacher blog. Le has many excellent intelligent and well considered thoughts - he is always worth reading. It occurs to me that there are a number of powerful decision makers right now in the UK who could read this and wonder if they should think again about recent decisions concerning school buildings. Unbelievably some of the new Government seem to be even jeering about the fact that learning environments make a difference to student achievement and motivation. How limited is that view? For more of Le's recent articles click here.